Keith Warren Nelson was born October 13, 1923 in Abilene, Kansas. His 92 years of life were full and rich. His mother, Helen, was sent to Kansas on the “Orphan Train” in 1912 with three other siblings. Together with her brother (Robert), Hubert and Sally Kready became their legal guardians. Eventually Helen left to attend High School in Nebraska. After Keith’s birth she returned to the Kready farm; Keith grew and attended local schools. Both of them earned Normal Teaching training as part of the High School program and two months before his 18th birthday, Keith met his class as the teacher in a one room country school. They decided after one year to pursue further education, and so they registered at Weslyan University. There Keith played clarinet in the band, sang in the choir and was 1st tenor in the church quartet. Meantime, Mr. Kready suffered a stroke and asked Keith to return and help at his large farm as a partner; this he did. His mother moved to Los Angeles to work at Western Union. There she remarried to Henry Heise. Keith was back in Kansas with a herd of Brown Swiss cows and was living a farmers’ life. Mr. Kready eventually recovered, so Keith decided in December of 1949 to join his mother and Henry in Alhambra, CA. In California he enrolled at USC. Many events made good material for his famous “stories.” At USC he earned his teaching credential in music education, played clarinet in bands, sang in the choir and worked part time. 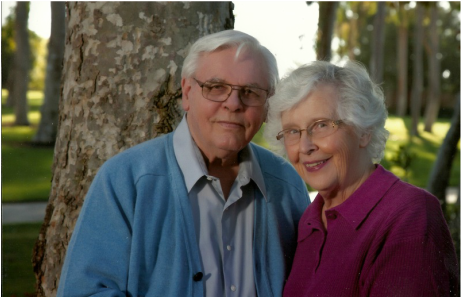 He began teaching as a traveling music teacher in Westminster, CA in 1954. In his Senior year at USC, he was President of the Phi Mu Alpha, a professional Men’s Fraternity. He completed a Master’s degree while teaching and in 1958 was President of the Trojan Alumni Marching Band (he marched in the Rose Parade twice). Keith also served as President of the USC School of Music Alumni Association from 1959-62, now known as the Thornton School of Music. In 1961, he married June Lusk, also a USC School of Music graduate. The marriage lasted 54 ½ years. As Keith’s teaching career took many turns, he also became a licensed NASDAC insurance agent and began his 61 years in the summer music camp ‘business,’ the first 17 years spent working with Idyllwild ISOMATA, the rest at Wildwood Institute of Music and Art - a program sponsored by a non-profit corporation of which he was a direct founder and President for 44 ½ years. He ‘retired’ from formal school teaching 25 years ago. Still busy, he worked on a committee that after three years produced the local ‘Venta Spur’ park in Irvine. He also became legislative chair for the local branch of the California Retired Teachers Association. He enjoyed reliving trips to Africa, Russia, many European jaunts and concert excursions. Also special were his weekly political ‘discussions’ with his good friends, June’s private piano students, keeping Wildwood on the straight and narrow and above all sharing his life stories with friends. Keith passed on December 23rd, 2015 at home where he spent his last days in his beloved “Lazy Boy” chair. That was his dearest wish and with the help of neighbors and hospice it became possible. The last illness was his only one. He never complained and went peacefully although he must have been in great pain. A dedicated teacher, he taught music and world history at Palos Verdes High, Mayfair High in Lakewood, in the Pasadena School district, and at Mission Viejo High. The number of lives he touched as a teacher is innumerable. He is survived by his wife June. His legacy lives on in the family of musicians and students that formed around them as a result of Wildwood. He will be greatly missed and his absence felt by all who knew him.